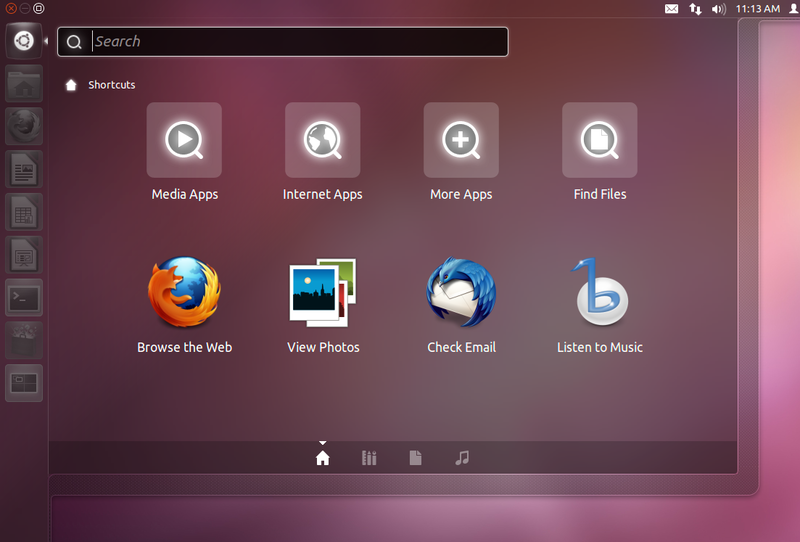 Canonical and Ubuntu have reached yet another milestone with the release of Oneiric Ocelot, Ubuntu 11.10. 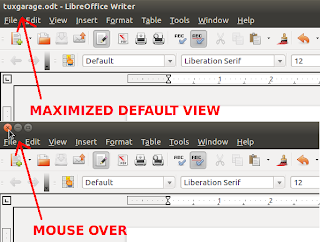 There have been many controversial changes like the removal of Synaptic and gconf-tools, auto-hide of window buttons unless you hover you mouse over them etc. On the other hand, there have been many welcome changes including visual, accessibility and functional improvements. So here is a list of important changes that Oneiric has came across. Ubuntu Oneiric comes in Hybrid ISO images and it is the first Ubuntu release featuring Linux Kernel 3.x, Gnome 3.x and also Multiarch support. NOTHING. Absolutely nothing. Sure, we have the usual two thirds driver changes, and a lot of random fixes, but the point is that 3.0 is just about renumbering, we are very much not doing a KDE-4 or a Gnome-3 here. No breakage, no special scary new features, nothing at all like that. We've been doing time-based releases for many years now, this is in no way about features. If you want an excuse for the renumbering, you really should look at the time-based one ('20 years') instead. "In addition to the driver changes (and the bulk really is driver updates), we've had some nice VFS cleanups, various VM fixes, some nice initial ARM consolidation (yay!) and in general this is supposed to be a fairly normal release cycle. The merge window was a few days shorter than usual, but if that ends up meaning a smaller release and a nice stable 3.0 release, that is all good. There's absolutely no reason to aim for the traditional '.0' problems that so many projects have. Oneiric adds multiarch support which means that users with 64-bit system would be able to install 32-bit packages without the need of any additional libraries. There were minor yet important changes to the installer. It now lets you add a Wifi connection if needed and you can also take a photo via the webcam for setting it as your user account picture. 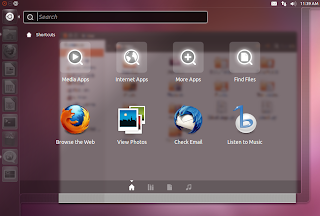 Ubuntu Oneiric comes with Gnome 3. 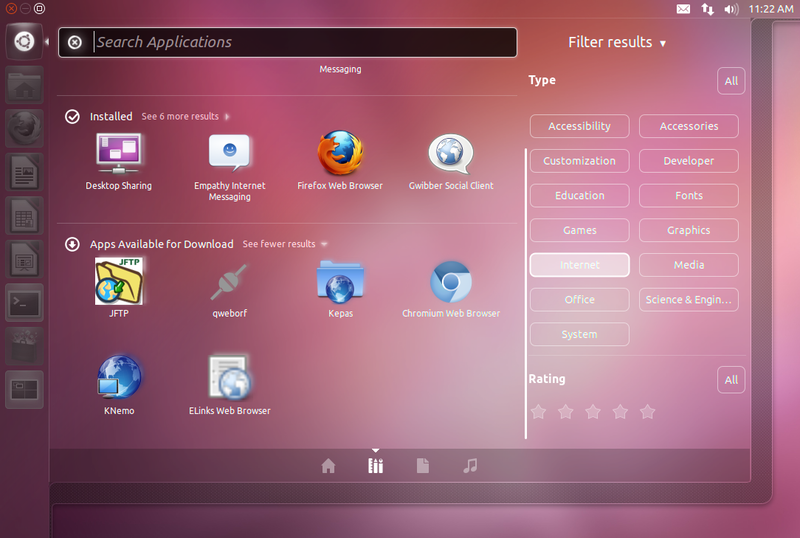 The panel, launcher, almost all the applications, light themes etc have been ported to Gnome 3. 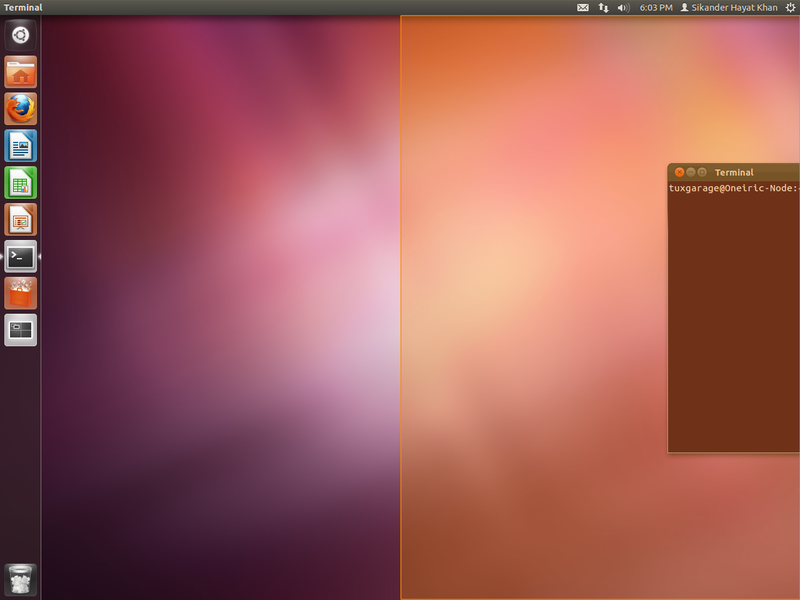 This also means that you can run Gnome-Shell without a hassle in Oneiric. Unity has improved a great deal since the release of Natty. Some people were calling these 2 releases as big betas to 12.04 but Oneiric is a stable enough release already. 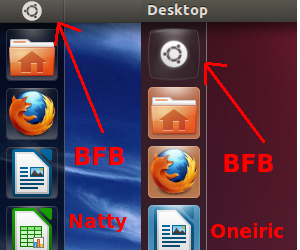 The Big Fat Button (BFB) or the Big Ubuntu Button (BUB) whatever you call it has been moved the launcher in Oneiric whereas in Natty it used to be in the top left corner, in the top panel. 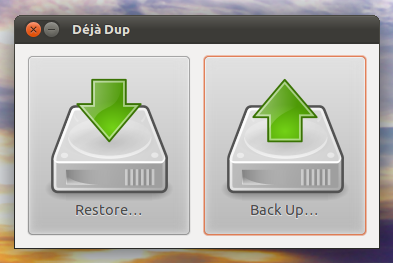 It has also got a re-designed icon. The space freed by the BFB is now reserved for the window titles and window control buttons in Oneiric. Unity no doubt came across a long way in the last 6 months. Mainly, Unity is all about the Dash, Lenses and Launcher, right? Visual improvements have struck every single pixel of Unity and not to forget the improvements in stability and performance also. The Dash has now got its own control buttons for maximizing and closing it. 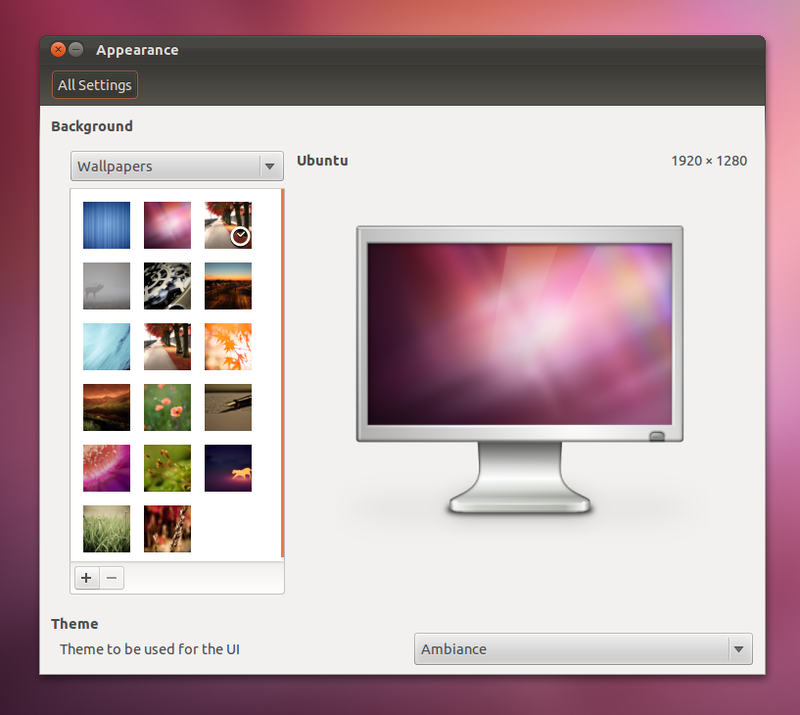 The borders are visual pleasing and it inherits the desktop background colour quite effectively now. Even the top panel inherits the same colour as well as the Dash and the Launcher when the Dash is open. You can notice that in the screenshot below. 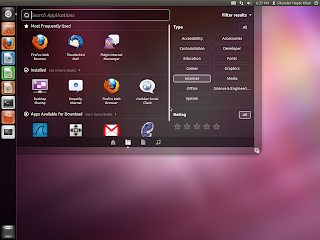 The Launcher has also received both direct and indirect improvements. 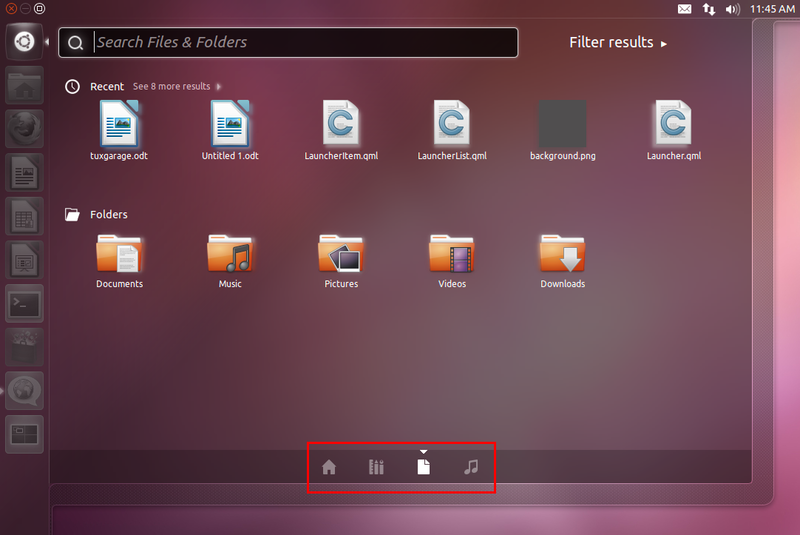 Integration of Files & Folders and Applications Lens into the main Dash has freed up some space from the Launcher. The Launcher now holds the BFB as well. It inherits the background color by default, dims when the Dash is open but become saturated when the mouse is rolled over (when the Dash is open). Applications and Files & Folders lens have been integrated into the main Unity Dash and also a new one has been added i.e. Music Lens. 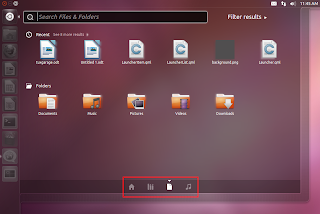 Music Lens lets you browse music from the local folders as well as from Ubuntu One. You can browse through these lenses by clicking their icons near the bottom of the Dash. Oneiric's Unity 2D is quite great in its resemblance to the original Unity and also, the functionality. Unity 2D is the default fallback session in Oneiric whereas Gnome Classic (without effects) used to be the default fallback session in older releases. If your hardware (or drivers etc) don't meet the minimum requirements for running Unity, you'd be taken to Unity 2D automatically. Unity 2D Dash supports the lenses equally well as the Unity one does. All the filtering options are there as shown in the screenshot above. With Unity, they are focusing on the accessibility. Many might not agree with me here but once you get used to Unity (or Gnome Shell for that matter), you might never want to go back to Gnome 2.x. You've got the right to disagree though. 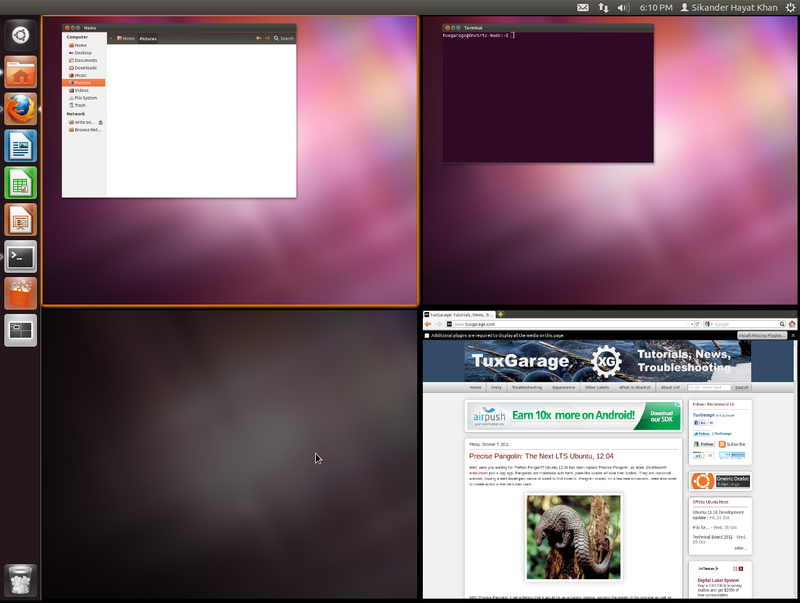 Workspaces are now presented in a more pleasant way. 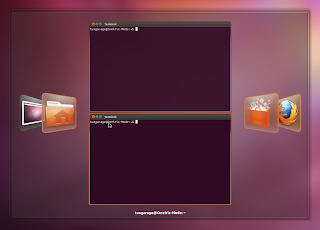 The selected workspace has an orange border around it whereas the idle workspaces with no applications on them are dimmed black. Most of us are familiar with 'Aero Snap'. The same sort of functionality has been implemented in Oneiric that when you push a window against the left or right screen edges, it tiles itself to one half of the screen. If you push it against the top edge, it maximizes itself. 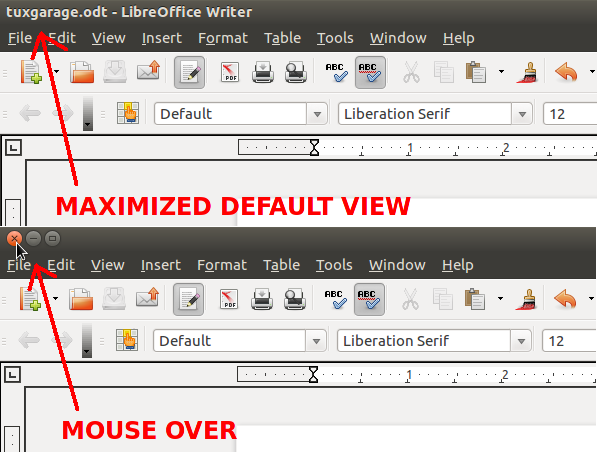 Window buttons for maximized windows automatically hide unless mouse is hovered over where they should be located. Well, how to know where they are located? Not that difficult actually. You can also get a preview of any highlighted application in Alt + F2 by pressing the <Down> arrow key. Oneiric scrollbars have been fully redesigned. They now inherit an orange border and the thumb itself has been reshaped into a rectangle rather than an oval shape (Natty). 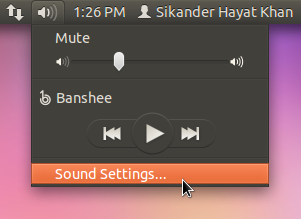 The scrollbars now follow the GTK+ color and also support right to left languages. In contrast to the improvements in Oneiric, the Precise scrollbars are already looking far better both visually and functionally. 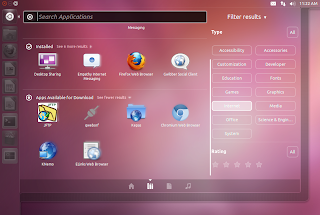 Oneiric themes have been fully ported to Gnome 3.x. 14 new wallpapers and a brand new appearance dialog was also introduced. Oneiric introduces a brand new appearance dialog / theme change, a very simple one indeed. 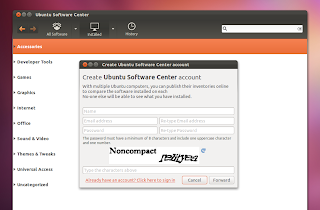 If you want to download all the fonts in Ubuntu family, you can download the complete package from here and install it in any older Ubuntu or any other Linux as well by extracting it to ~/.fonts and then re-login. 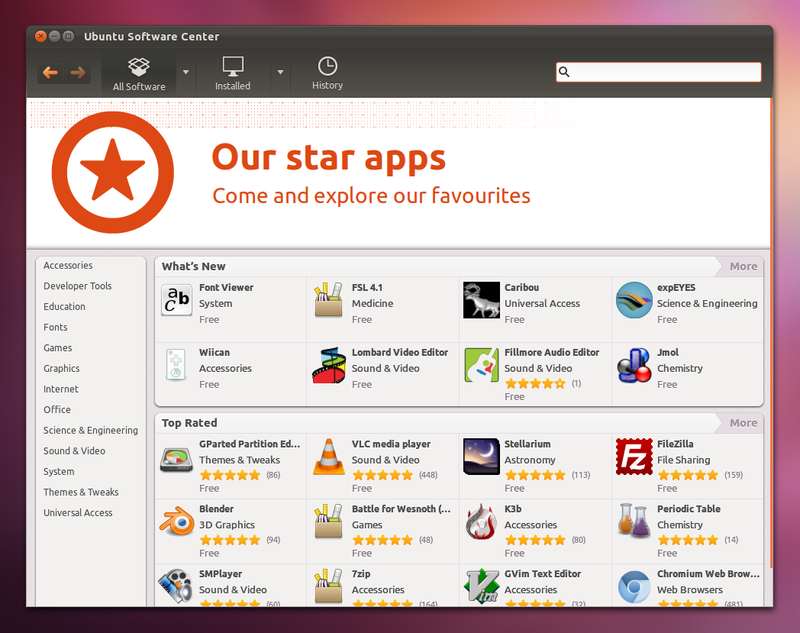 Software Center has finally received some attention from the developers and designers. It comes with a nicer interface, nicely categorized list and a better logo. And with the new software center, you can now even sync software between your PCs meaning that you don't have to individually search for and install the same software on all of your PCs. Go to File > Sync Between Computers... You'd need to create a user account for that. 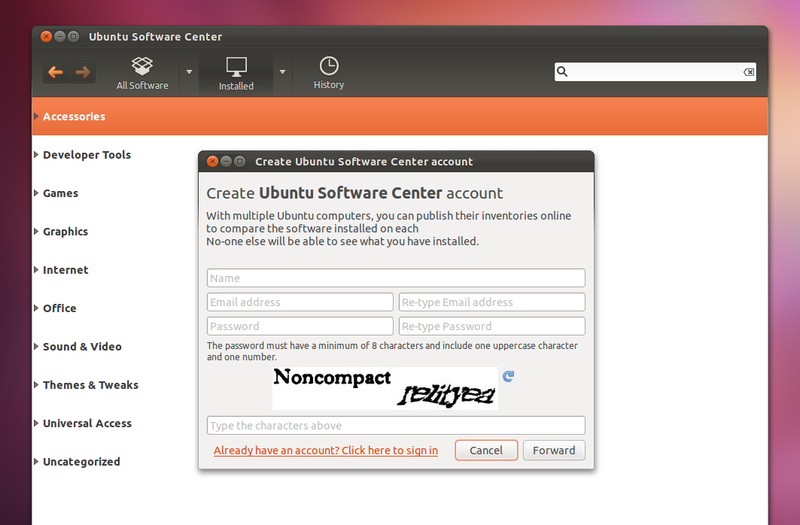 A new Software Center icon is also introduced in Oneiric. There were a few controversial changes regarding the included applications in Oneiric. 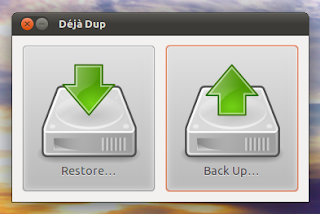 Deja Dup is present in Oneiric by default and it also supports Ubuntu One for cloud backups. It is nicely integrated into the Unity environment. Good news for the Thunderbird fans, it would be available by default in Oneiric. This is a long awaited and a welcome change. 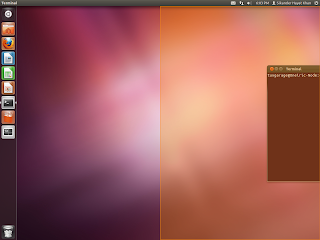 Thunderbird is far more superior than Evolution in terms of both functionality and interface, at least for me. Synaptic package manger, Pitivi video editor and Computer Janitor has been removed from Oneiric. Yes, you heard it right. Synaptic has also been removed! A really bold move but not a good one at all in my opinion. 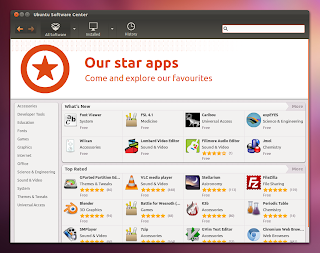 Software Center lacks many of the features provided by Synaptic and it isn't honestly ready to replace Synaptic yet. You are right in thinking that it is available in the official repositories and can be installed from the Software Center in a matter of few minutes but what if you have got broken packages and are unable to repair the catalog from Software Center. How would you install Synaptic then? For the experienced users, it isn't a problem as they can fix it from the Terminal but what about the new, less experienced users? For a detailed comparison of Software Center and Synaptic and instructions on how to install it in Oneiric, please take a look at this earlier post. Pitivi video editor and Computer Janitor have also been removed because they wanted to save some space on the CD ISO images. Both of them are still available in the official repositories. Just like everything else in Oneiric, the top panel has received some attention. The power button has been transformed into sort of control center where you can configure the system, displays, other hardware, updates and can also use it as a power button which it was intended for, initially. Switching between user accounts can never get easier than this. Click you username, select the user you want to switch to and it doesn't ask you many questions after that. 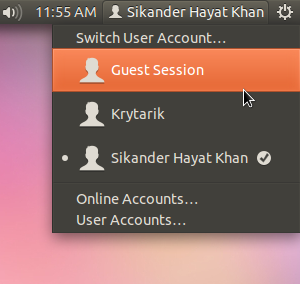 You can configure the accounts by clicking 'User Accounts...' near the bottom of this menu. Messaging and Me Menu have been finally unified. There were talks going on to merge them since quite some time. Now you can access everything from Empathy, Thunderbird to Ubuntu One under the same single menu. Ubuntu One really doesn't fit this menu as it has got nothing to do with messaging etc. There were talks going on to remove it but it is still there. 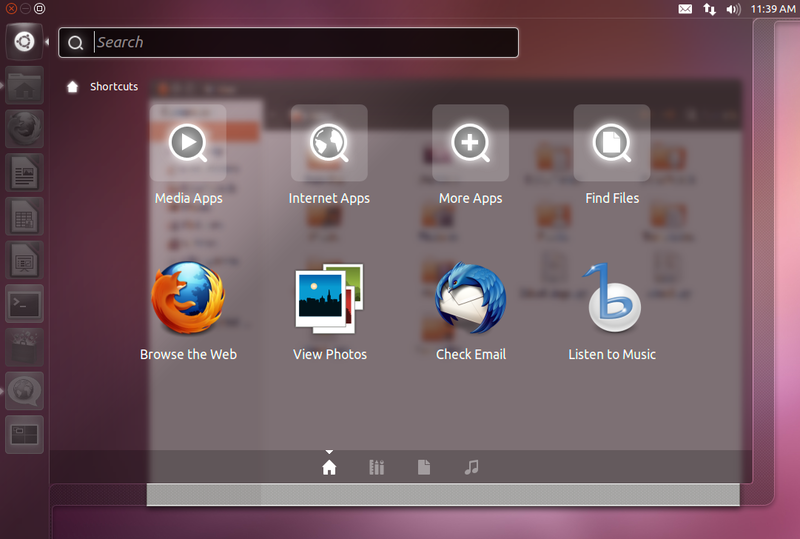 Ubuntu one is easily accessible from both the Launcher and the Dash anyways. 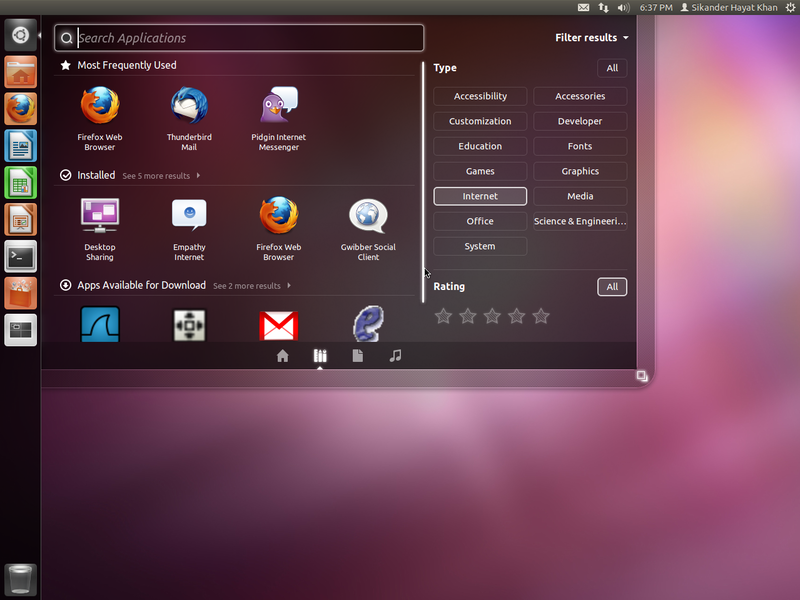 All other applications that are registered and not blacklisted will also show up in this menu e.g. 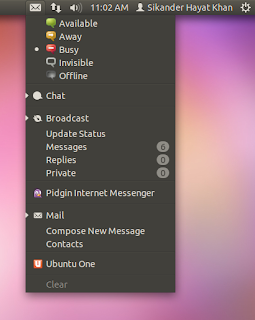 Pidgin Internet Messenger (as shown in the screenshot above), Skype etc. The sound menu has received a minor update. 'Sound Preferences' has been rightly renamed to 'Sound Settings'. Oneiric has been performing nice at both of the PCs I've tested with it however I get a feeling that the new Unity is just a touch heavier than the Natty one. Unity 2D has been nicely up to the mark in terms of performance. All of the hardware worked out of the box (as used to be with the older versions), open source Radeon driver also performs better than ever and I was able to run Unity with an X300 series ATI chip as well. Some sounds issues also got fixed and the USB file transfer speeds have improved a bit. Movie player feels stable as ever without any issues. Banshee has also been performing nice. Not to say anything about Firefox at all. It has been quite up to the mark and no memory issues till now possibly because I've not been using many extensions with it. 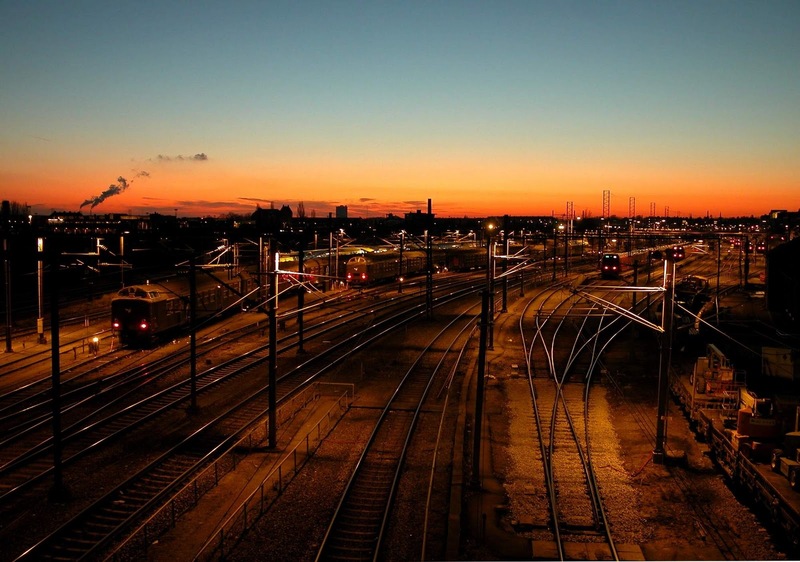 Many of the Flash issues have been sorted with the arrival of native 64-bit Adobe Flash Player. There were a few crashes during the development phase (which were supposed to be there anyways) but I didn't experience a single one during the last couple of days. It has been performing rock solid since then. 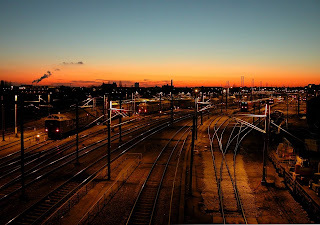 Not to say anything about many of the new features of Oneiric which are listed in this post as I am liking almost all of them except a few like the removal of Synaptic but not a big deal, you know.